Happy April loves! This story should have been covered in March itself. My Bad! Anyways. Guess who just got older? I just can't believe it. I completed four years of motherhood! This post has been long pending. 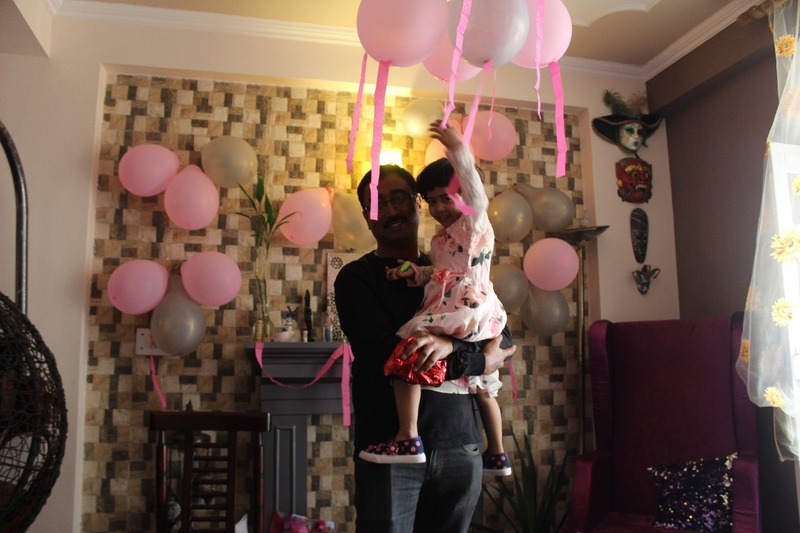 It's been a ritual to document my daughter's birthdays on my blog...and why not... isn't this the best and the most beautiful way to do so? You can read them here: 1st birthday, 2nd birthday and 3rd birthday. Each year had been different. 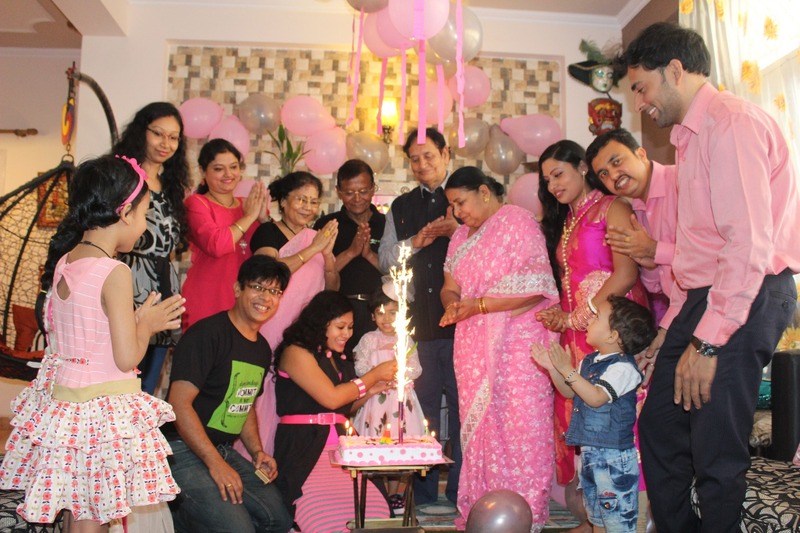 Her very first birthday was celebrated in her paternal grandparents' place in Varanasi and was celebrated on the day itself. The next two years there were two ceremonies. Since my daughter was born at a time when everyone's exams are going on, it's foolish to think that people would join the party. So we celebrated on two days....one on the original day with just family and then a grand celebration later on when the school exams got over. The person who loves her even more than me! MIL giving a stellar performance! This year we kept it very low with just family members joining. Also this was the first time I cooked everything myself! Phew! That was tedious yet very rewarding. Thankfully my mom took in chart of frying the puris or loochis (which I find the most difficult) Also she brought her signature dish of Rice pudding in Nolen Gud ie date jaggery which was a hit with everyone. Our sweet guests helping themselves! Now coming to the party, you can already guess the color theme. I had only heard about girls and their obsession with pink. But I had never experienced it myself. I mean my favorite color had been light green since I was born. Few of my colleagues at my previous health center were very fond of pink. 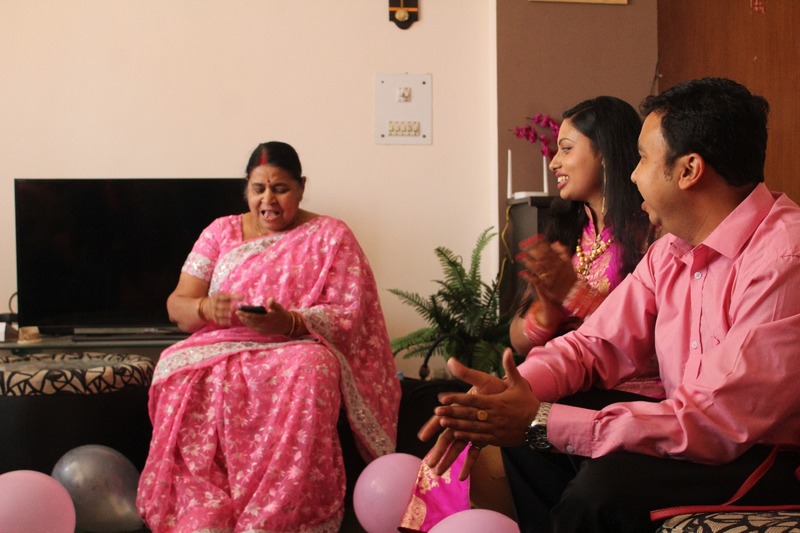 However it was not before my daughter came to her senses that I realized her obsession for pink. I mean obsession on a pathological level. She needs everything of hers in this girly hue....pink apparels and belongings are an understatement; she needs pink plates, pink spoon, pink table and even pink doors. How freaking crazy is that? I just hope it's not permanent! Me giving a razzmataz performance! 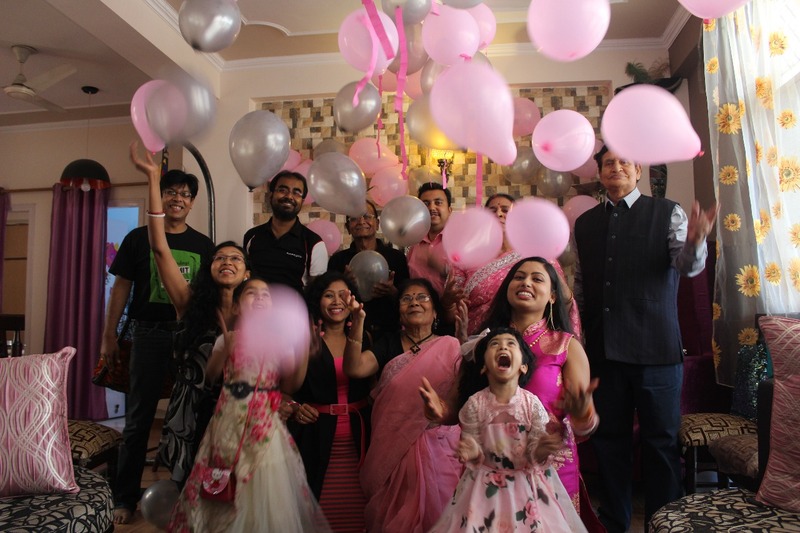 So it's a no brainier I chose pink and black theme for the party. In fact she was questioning me as to why I am blowing black balloons; I should have just stuck to pink ones. To keep things even more interesting, I kept a pink and black dress code too! My guests were so sweet that they all followed the color theme. In the end, we all were looking super cute! 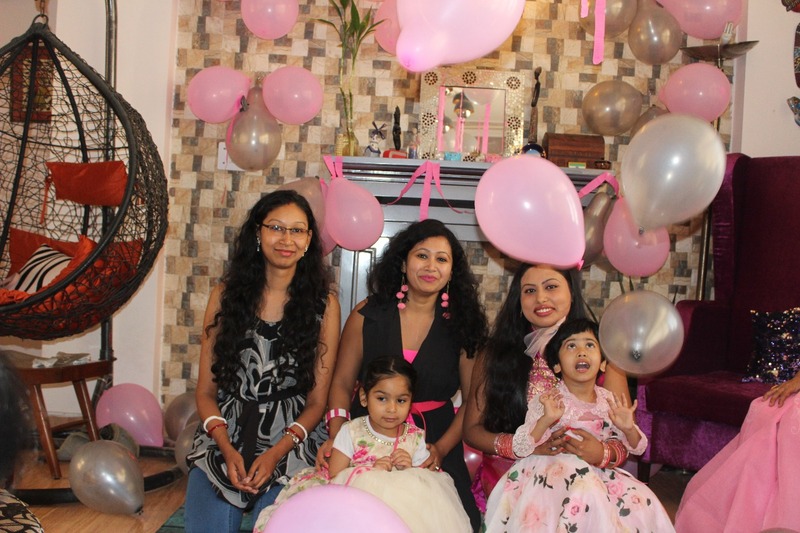 Mohi with her loving Aunts! I know that motherhood can be exhausting beyond imagination and one of the biggest challenges of life. However if I introspect, it's undoubtedly the most rewarding role too. It's brings me ecstasy and satisfaction like nothing else. At the end of a frustrating, depressing day, her tight hug becomes my greatest mood uplifter. It's almost every second day that I doubt my mothering skills. But I am on a quest to become better everyday. When I suffer from bouts of depression, I slag in taking care of her. But at the end of the day I am just a human only. I just hope I would become a better mother with each passing day. Happy birthday to me, as a mom. Happy birthday to my princess. There's no one in this universe whom I love more. I wish you all the happiness, health and success in this world! Wow time fly by, Happy Birthday to your little princess so cute perfect party. Wot a sweet post. N I love the concept of planting a tree for a birthday. Happy Birthday to your baby girl!! How exciting!! 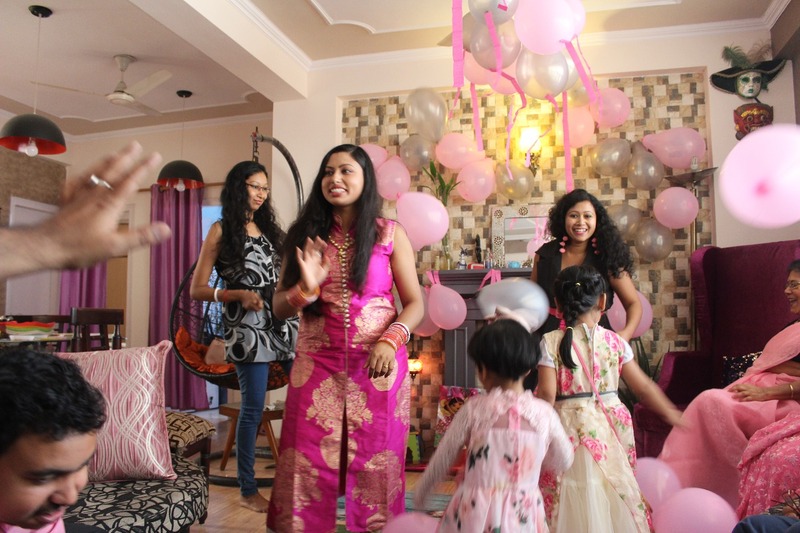 And her birthday party looked so fun!